Are you looking for wildlife tourism? Get the best tourist experience of wildlife through Manas National Park in Assam. The Manas Wildlife Sanctuary or Manas National Park in Assam is situated in the foothills of Himalaya, is a Natural World Heritage site. Whenever there is a Wild Life special issued by any of the travel magazines, that's something, I will surely pick up. The unspoiled nature and wilderness and the feeling of wildlife lurking around give a sense of excitement that most other travel destinations fail to offer. It is not just about seeing wildlife as many other travelers often inquire. I often wonder what should my response be to the 9 out of 10 questions once you come back from a wildlife tour...."did you see a tiger". At times I feel like responding "well I didn't go to a zoo"; at times I feel spending time with the person to impress upon them that traveling to a National Park is just not about spotting tigers. And at times I end up answering ...."well I didn't, but I am sure he spotted me". I could inflict my passion of going out to places on vacations first to my wife and then partly to my kids. As an unintended addition, what also got deeply embedded in them is that all the basic comforts should also be a part of such plans. While the same is possible for beach and heritage locations and even partly for hills, I never felt that luxury and wildlife vacations go hand in hand. If you want luxury in a wildlife vacation, you need to compromise on the intensity of the passion for the flora and fauna of a Sanctuary of National Park or vice versa. An expression of similar sort at workplace led to immense excitement amongst a couple of other colleagues to venture out to a National Park which is still not infested with Jeeps for safari all across. I could gauge they too were struggling with the similar challenges at home to have minimum expected comforts while on a vacation. Manas National Park in Assam was named along with Kaziranga as the two most famous National Parks in North East more than 2 decades back. 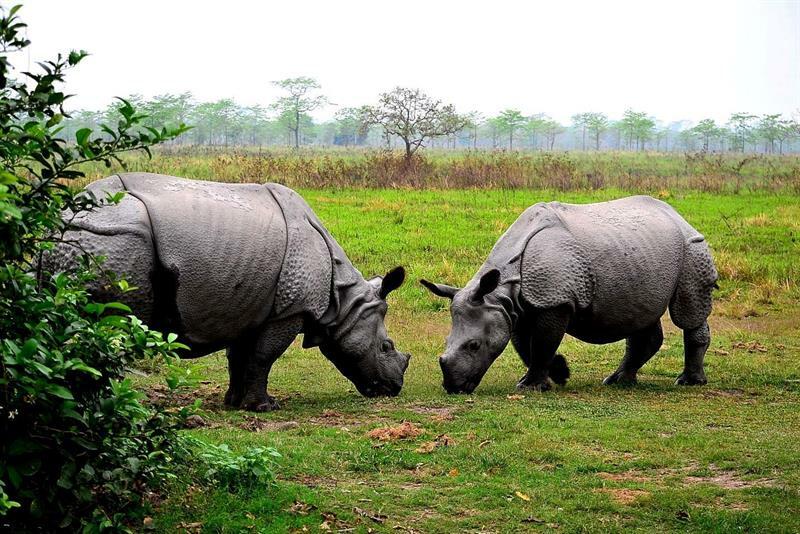 While Kaziranga marched ahead in terms of popularity, Manas National Park languished, primarily due to security and safety perceptions that travelers had during that phase. And today it is evolving. I wanted to rush there before it evolves and gets infested with green safari jeeps. And both my work colleagues were game to it. Well, they had their adrenaline rushing since one of them came back to me in 30 mins saying that he has booked the return ticket as per our plan. To make it a truly weekend destination, Saraighat Exp from Howrah is the best option. Departing from Howrah Stn at 3-55pm, it gets you to New Bongaigaon next day at 6-20am. Similarly, the return train departs New Bongaigaon around 3-30pm and reaches Howrah Station early in the morning. Departing on a Friday and reaching back on a Monday morning allows you to take 2 trips to the jungle and one elephant ride. One more day makes it absolutely ideal to savor the sights and smell of unspoiled nature. You may also choose Kamrup express which departs at 5-35 pm from Howrah. The advantage is you can alight at Barpeta Rd station which is 45 mins from Manas. But since it reaches at 12-45 pm, you risk missing the afternoon safari that day. Once you arrive at New Bongaigaon station early morning, it can itself be a nice sightseeing stopover. Clean and idle platform with very few people around, nice paddy fields and the platform acts as a culvert to a stream trickling below. In a while, we were driving through the last stretch of our 2-hour drive, parallel to the Manas National Park in Assam. When traveling in lesser known nature trails in North Bengal and North East, I often land up at Help Tourism Office in Kali Temple Road. They work closely with the local people to build up tourism in those lesser known places and also help the communities earn a living. And going back to my initial point...they offer facilities where you are pampered amidst basic amenities and the jungle lodges are not spoiled with avoidable luxuries, which snatches away the very feeling of being amidst nature. Warm welcome and personalized care by Mr. Lama and team at Florican cottage made the stay at Manas National Park in Assam more memorable. With greenery all around, the rooms in Florican are also painted green outside to ensure seamless harmony with the surroundings. As I said, this place is for nature and wildlife lovers and devoid of Television and has only limited mobile signals, something we welcomed heartily. Food is basic yet amazingly tasty...maybe the warmth of their hospitality made it so heavenly, more so after hours in the wild. Subzis made of garden fresh vegetables cooked simply yet with care made them yummy. You may check out for country chicken in advance for one of your meals. All safari arrangements were taken care of by them and the jeep picks you up from the lodge. As we reached the jungle gate, one new experience awaited us. Manas National Park in Assam, apart from Guide, a gunman is a must while you enter the jungle. Well, the initial traces of excitement were visible in our inner self. Elephants in this part of the country are extremely aggressive and at times firing in the open becomes a necessity if you end up being amidst a wild herd. Well, such experiences always happen with others is what we all believe. Typical of most safaris, the first animal/bird that you see forces you to stop. And if it is the one you keep on seeing during the safari, in a while that stops being interesting to you. And in my safari experience peacock is one such casualty. The first or second sighting is generally a peacock. The jeep stops. You tend to take so many photos at different postures. Half of them anyway gets blurred because the jeep moved or the peacock raced past you. Within another 10 mins the jeep deviated from its planned route and I could guess we were n a narrow track which may have a dead end. And slowly surfaced a group of at least 30 odd elephants. A couple of baby elephants in the herd made the guide and gunman alert. Baby elephant in the herd means the mature ones are overtly protective and if need be, aggressive to ward off any intrusion. And the loud noises they made clearly indicated that as 3 of them slowly started trudging towards us. And it was one of those rare occasions when the driver and guide looked worried as the Jeep can only go on reverse gear since the pathway was too narrow for it to turn back. We went as fast as we could on reverse gear till the elephants convinced themselves that we were retreating. Good that we took the snaps well before we realized what can happen eventually since as the jeep reversed and elephants trudged forward, none of us pressed the preview button in our cameras to check the quality of snaps. Well…it reminded me of a similar experience 25 years back in Betla Tiger Reserve when during elephant ride, we were completely circled by a herd of wild animals and kept stranded for a few minutes before they decided to give way. Awesome sunset accompanied us on our way back. Some lovely onion pakoras and chicken fingers got us recollect the last few hours in wilderness…and uniquely the only jeep in the safari that we could see….the rarest experiences, Manas National Park in Assam. Time to connect the camera to a laptop and sort the photos. Too many of them. Time to check out which ones will be memorable and which ones are a casualty of hurried photo taking. Freshly cooked dinner of Roti, Subzi, Daal and chicken was the perfect finale to a memorable day in Manas National Park. The evening gave us a hint about the chill likely next morning and we were mentally prepared, though not physically, as we didn't carry any warm clothing. But what is the need when u can two giant rhinos are on the same platform as you are in…for almost 45 mins we had the rare opportunity of shooting photos of the rhinos standing on the ground meters away from them. For the first time, I got a feel how animals react when you get too close. As you get too close, there is an inherent tendency to push you back. We were uniquely lucky to spot them near a watchtower and hence we were allowed out of the jeep. Photos below will give you an idea. After an almost hour long dating with the rhinos, we moved on. Our tryst with elephants was far from over. As we approached a long stretch of narrow jungle path, we were overwhelmed to see a herd crossing over. Well, that euphoria was short lived. We soon realized we are cutting through the herd and half of it was yet to cross. One of the elephants, which just crossed clearly told us through loud trumpets to cross over and we were shivered to even slow our jeep as we crossed the place and stopped 500 meters ahead. And my friend took a snap which made us feel we were just beside them. 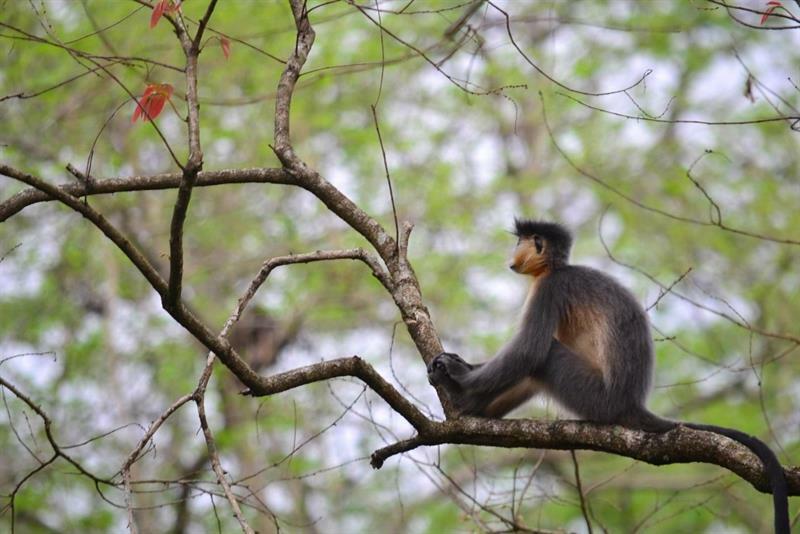 Golden Langurs are a rarity on earth today and spending close to 30 mins watching them move around in trees and pose for some lovely photos for us. Great Pied Hornbill, another rare species is found aplenty in Manas National Park and their face and beak is a riot of colors. The landscape of Manas National Park in Assam appealed to me in a unique way. Not in many National Parks, I have seen such a distinct transition from the moist deciduous forest which at places is so dense that it limits the amount of sunlight that can penetrate through it and as you travel in the jeep, you slowly emerge out from that into alluvial grasslands. If one leaves out what Manas is famous for i.e. 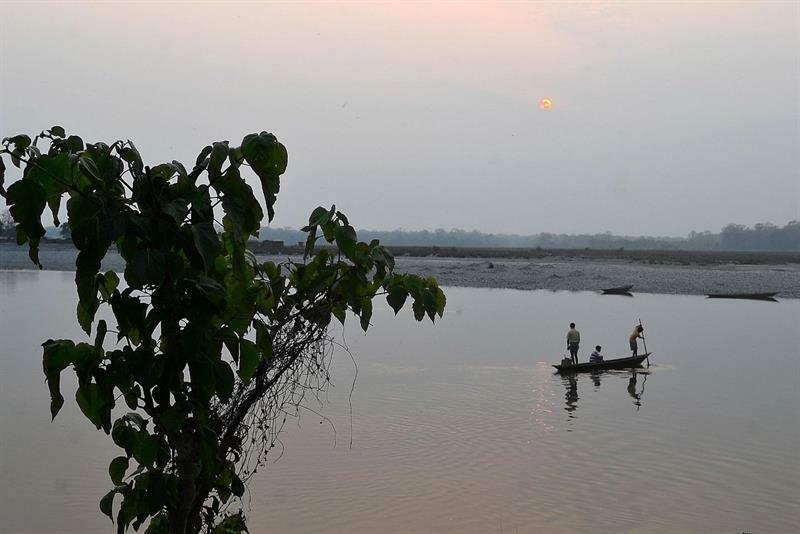 the National Park, Manas river in itself offers some serene yet peaceful weekend destination. The same flows through the forest at times and at times along the edge of the forest creating a natural boundary between India and Bhutan. Standing on one side, you can see the Bhutan hills gradually rise up little away from the white sand banks of the river. Particularly beautiful is the view from the Inspection Bungalow campus, which is inside the forest and can provide a wonderful overnight stay experience, deep inside the forest, beside the Manas river at an elevation. 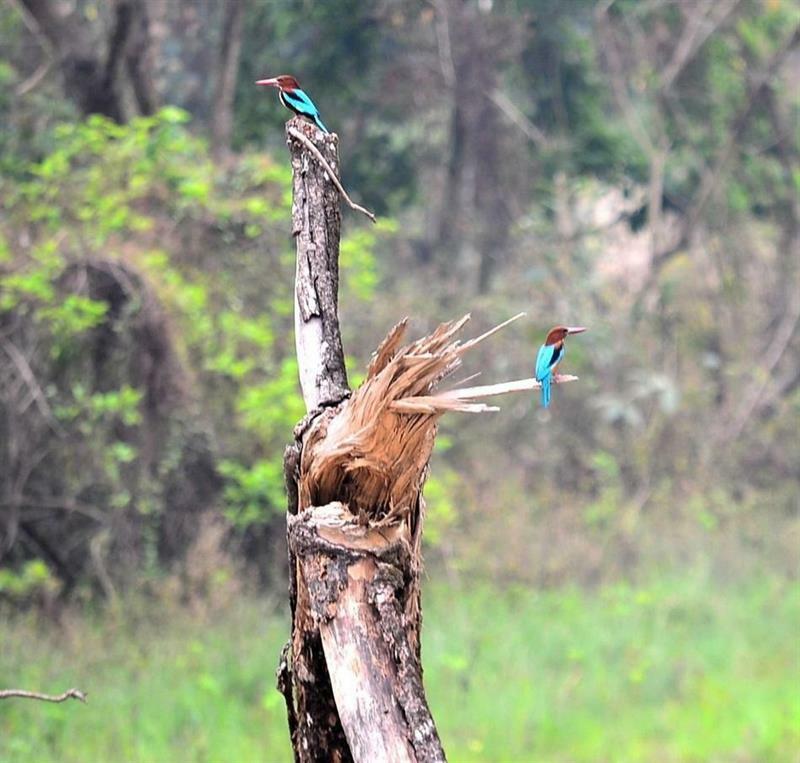 If you are a bird watcher, Manas National Park in Assam is a paradise for you. Small Minivet, long-tailed minivet, Pied Flycatcher, Black rested Bulbul, Lesser Adjutant Stork, Russet Sparrow, Canary Flycatcher were some of the birds we kept spotting not only during the safaris but also in the tress around our lodge. Silence and tranquility give you the rare opportunity to hear the birds chirping at times and that's the only sound around you. We spent one afternoon lazing in our lodge and going out for a walk down the banks of Manas river, watching the local people cross over from one side to another and fishermen setting up the net for the next morning. Our two nights stay was coming to an end. It took us slightly less than 3 hours to reach Guwahati airport, the day being a Sunday. While I am had my experiences in a few national parks, for my colleagues this was something unique, untasted. Hence the journey back was spent on discussing what next! Tadoba or Kaziranga are the two strong options emerging. Assam is a beautiful state with many hidden treasures. One such treasure is the Tilinga Mandir or Bell Temple, dedicated to Shiva. You might not find it in the tourist brochures, but it must be on your 'must visit' list, when your plan an Assam trip. Are you planning to make a visit to Assam? Read this article and learn more about best tourist places in Assam. Very interesting blog with a lot of information on wildlife tourism of Assam, and awesome pictures of animals in Manas national park. A comprehensive travel story on Manas national park. Provides a tour sketch which definitely will help a newbie to know more about Manas national park and the wildlife tourism in Assam. Looking forward to more like this from the author. 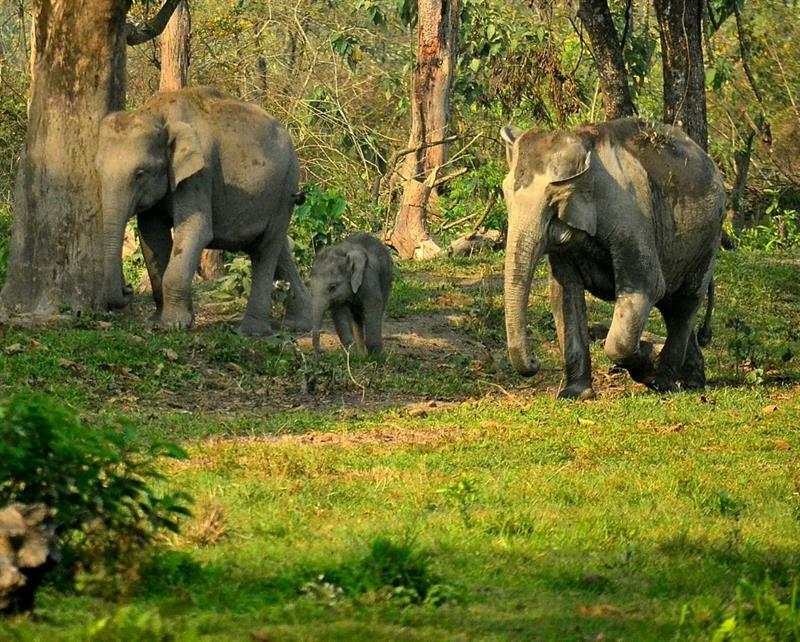 Very informative and nice writeup about Manas national park. This will surely help the travellers to know more about the wildlife tourism in Assam. Beautiful pictures of Manas national park and good travelogue about the wildlife tourism of Manas national park.